So I'm sitting here watching a few snowflakes fall outside my window. Looking at these pictures Courtney Beth Photography took back in October. I'm so itching for warmer weather. I'm usually all about the snow & cooler weather up until Christmas then I'm like... okay you can be done now. I hope everyone had a wonderful new years, it was so nice being around family & friends this past week. Liam & Sawyer are both sick now & just can't seem to kick this cold that has come about. It's like immediately after Christmas bring on the sickness. It came full force, I ended up taking Liam to the doctor so they could give him a something because the poor kid was miserable & I felt helpless. I'm glad I did otherwise we would be getting a lot less sleep around here. So thankful for two boys that sleep through the night. I don't know how you mommas do it with kiddos that are tough sleepers. So how cute is this top that I found? I occasionally go to the thrift store to find some hidden gems & this was one of my finds. Believe it or not, this top is the definition of vintage. It came with no tags, almost a tea towel material with baby blue hand stitching on the inside. I just found it so unique. I just pictured this young fashionista back in the day who had big dreams of becoming a clothing designer and came up with this on her own. 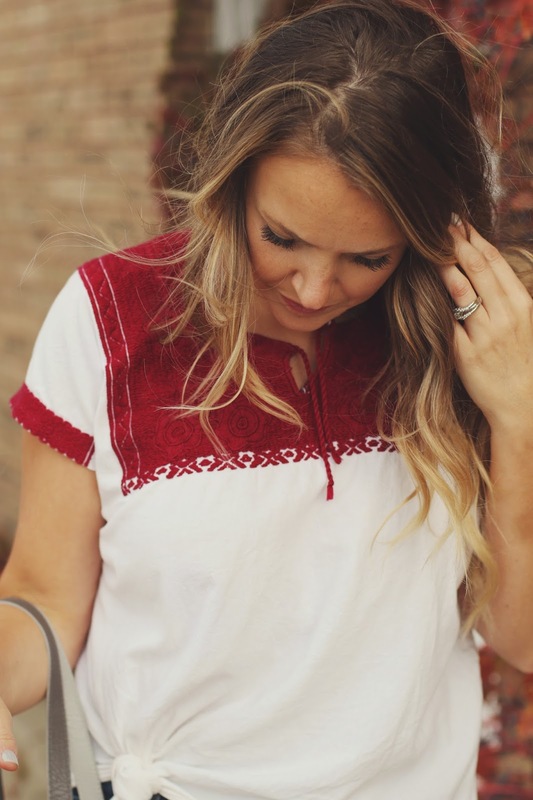 Everything on this top is hand stitched & perfect. Am i the only one who loves finding a story behind vintage clothing? I hope this post gives you a little inspiration to go out and find some vintage pieces of your own. Switch things up a bit, just like I tied the side of this top. Things like this don't have to fit perfectly but make it work for you.